I just finished reading a nice book about John Snow and London in the mid-19th century. The book tells the story of Snow’s idea that Cholera is transmitted through water (and not air). The book has a website here. The book is from 2006, so chances are that you have already read it. I was reading the book in the hope to learn more about diseases and epidemiology, but I think I ended up learning more about research in general. I also learned that London was a smelly place in the 1850s. 1. Research is hardly ever done by one person alone. 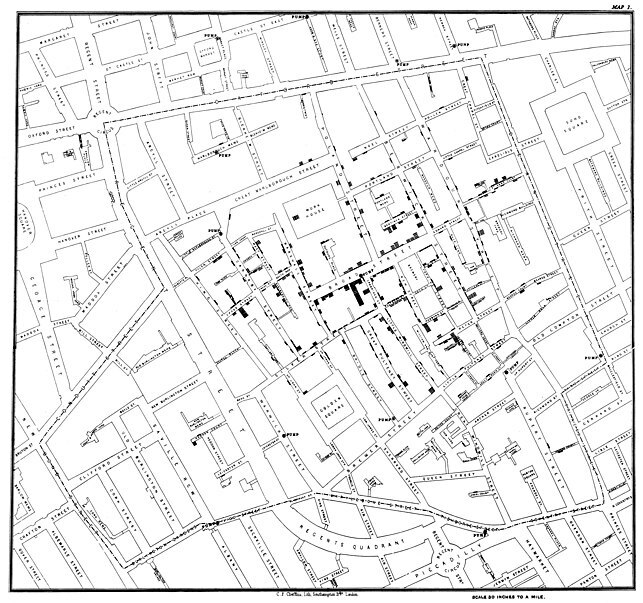 John Snow was probably a great researcher, but he couldn’t have done his important work on Cholera without the help of statistician Farr and reverend Whitehead. Even in the 1850s, science was a collaborative enterprise. 2. It is OK if people don’t believe you. In fact, a lot of the evidence for the waterborne transmission route of Cholera came from Whitehead, who was on a mission to disprove Snow’s theory. 3. Changing opinions takes time. It took many years, lots of data and papers before people started to believe Snow’s idea, even though Snow was well known and a respected physician. The map that figures in the title of the book didn’t reproduce well on my Kindle, so I had to look it up on Wikipedia later. Honestly, I find the map not very impressive. Sure, it may be important in the history of epidemiology and the history of data visualization, but I was slightly disappointed that the map wasn’t clearer. It is supposed to show that all the deaths occurred near one pump. But The locations of the pumps are not very clear at all. It also doesn’t show the surprising pockets of Cholera absence that are described in the book and that were important for Snow’s inference. The book is highly recommended! I recently published a review paper on HIV drug resistance. It was the first time I wrote a review paper and I enjoyed it thoroughly! It is also my first paper with Stanford as my affiliation: I walked the beautiful Stanford campus and enjoyed the sun in the breaks from writing. Many of you probably know that the majority of the world’s HIV patients live in poor countries, especially in southern Africa. You may not know that many of these people are now receiving very good treatment. I had the unique opportunity to see the effects of improved access to treatment “on the ground” in Africa. Last summer I was in Ethiopia for a few weeks and stayed in the Medhen social center in one of the slums in Addis Ababa. I knew that, for many years, much of the efforts of the Medhen center had focused on HIV/AIDS, and I was expecting to see the devastating effects of HIV/AIDS during my visit. However, the situation had changed a lot. The Ethiopian government now provides HIV drugs free of cost and most HIV infected people in the slum were doing well. In fact, there was no way for us to know who was infected, unless one of the nurses told us. The social center still supports some HIV patients, such as infected orphans who need financial and social support, but most of the center now focuses on “normal” poverty relief: housing, education, employment etc. The World Health Organization also reports that access to treatment has improved dramatically in low- and middle income countries: from 300 000 people in 2002 to 9.7 million in 2012 (see here). HIV treatment almost always consists of a combination of three drugs, often in a single pill. However, treatment only works well as long as the virus is not resistant against the drugs used. Fortunately, there is good news about drug resistance too: HIV treatments have become better and better at slowing down the evolution of drug resistance. Thanks to powerful drugs and close monitoring, many patients are now treated for many years without having any resistance problems. In my review paper I describe that drug resistance is virtually solved in rich countries, but still a problem in poor countries. One reason for this is that poor countries often lack the possibilities to monitor the viral load of patients and to sequence the patient’s virus. The paper also describes what is know about the relevance of pre-existing mutations for the evolution of drug resistance in a patient (also known as standing genetic variation or minority variants, depending on which field you’re from). Finally, I write about pre-exposure prophylaxis (taking HIV drugs to prevent infection) and how this is related to drug resistance. I hope you enjoy reading the review paper as much as I enjoyed writing it!